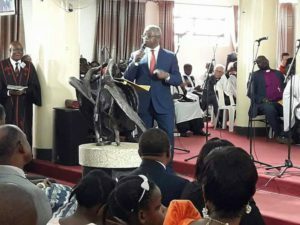 Former Prime Minister Amama Mbabazi has said Uganda in dire need of regime change and urged religious leaders to preach the message of hope that it can be achieved. Speaking at the installation of the Rev Onesmus Asiimwe as the new chaplain of St Francis Chapel at Makerere University on Sunday, Mr Mbabazi underscored the importance of change in our politics. “Change is critical for survival of our society. We need change in order to experience and have a better life,” said Mr Mbabazi, who was making his first public comment since losing the 2016 presidential election petition to President Museveni. The former NRM secretary general also urged religious leaders not to fear speaking out against injustices in society. Of recent, religious leaders and government have been logger heads, with the latter warning the former to keep from politics. “I am one of those working that things be better. Don’t listen to other voices, speak out. Your message is to speak a message of hope, condemns corruption, repression, the spirit of emptiness and brings hope that change will come,” Mr Mbabazi said. Mr Mbabazi has largely maintained silence, occasionally appearing at non-State public functions, since the Supreme Court where he challenged the election results ruled that Mr Museveni was validly re-elected. Last year, sections of the media reported that President Museveni was holding secret talks with Mr Mbabazi and the latter’s eldest daughter, Ms Rachel Ciconco, acting as a go-between. However, nothing has since borne fruit. Until four ago, Mr Museveni and Mr Mbabazi enjoyed personal and political camaraderie spanning four decades. Things began faltering in early 2014 when the ruling National Resistance Movement (NRM) caucus, in a motion introduced by current State minister for Investment and Privatisation Evelyn Anite, ring-fenced the party’s presidential flag bearer slot for the incumbent. The relationship later hit rock bottom and Mr Mbabazi, then the prime minister and secretary general of NRM, was booted out from both powerful positions. He stood as an Independent in the 2016 February elections and garnered only 132,574 votes, ending in a distant third position among eight contenders.